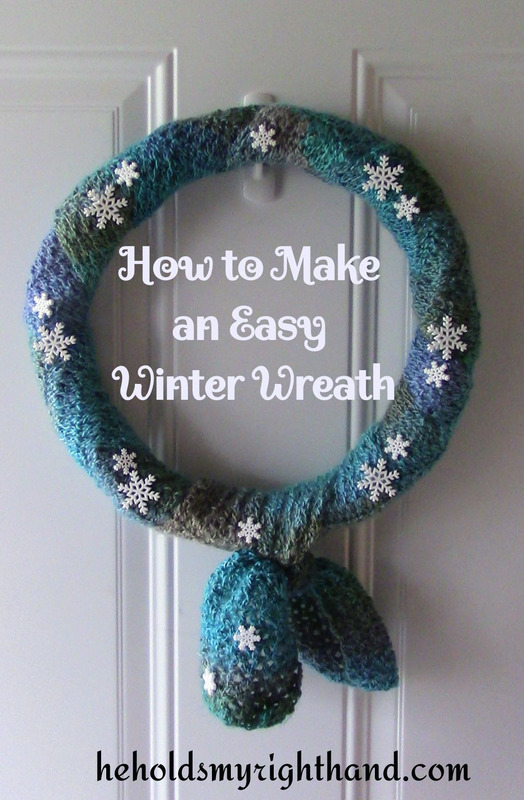 I decided I wanted to try making a wreath, so I looked around on Pinterest until I found some ideas - something that would be easy to do - and I found an idea for a very easy and inexpensive Winter wreath. I'm not a super crafty person but, seriously, anyone can do this! It is so simple. A round wreath base. I found a wooden vine type of wreath at The Dollar Tree for $1.00. A long winter scarf. I found a nice one at a resale shop for 25 cents. Winter-themed buttons or felt decorations. I found a small bag of plastic snowflakes in the craft section at Walmart for less than $2.00. A hot glue gun and hot glue (which I already had). Wrap the scarf evenly around the wreath base and tie it in a knot at the bottom (In some cases, you might find it easier to cut the scarf in half lengthwise before wrapping, so you end up with enough material to cover the base). Then, hot glue the decorations around it.